by Brett Rogalsky A few headlines were difficult to ignore following the Sundance Film Festival. One of these headlines was “Daniel Radcliffe’s Farting Corpse Movie Prompts Walk-Outs.” Fair enough. To get the obvious elephant in the room out of the way, yes, the corpse in the movie farts. A lot. It’s a recurring thematic element that’s actually a metaphor for personal feelings and thoughts — but they’re definitely farts. Now that I’ve covered that, we can get into the thrilling indie that is Swiss Army Man. Envisioned by the new directing duo, Dan Kwan and Daniel Scheinert, the film tells the story of Hank (Paul Dano), who washes ashore on what he believes to be a deserted island. 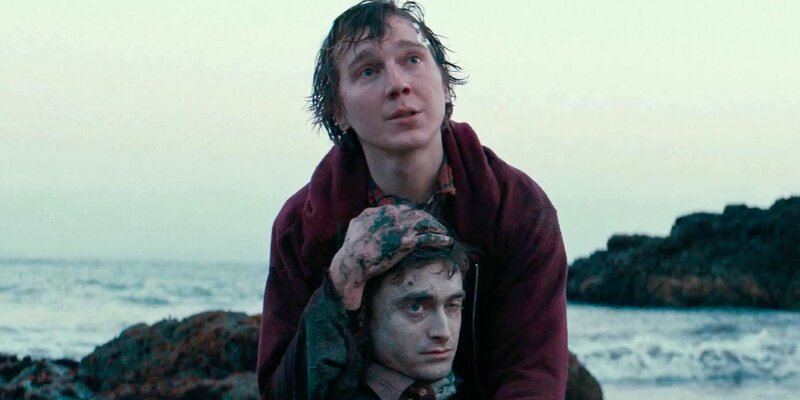 He finds an unlikely friend in Manny (Daniel Radcliffe), a corpse lying on the beach. Manny talks to Hank and helps him in various tasks by using his body as a tool, with the ultimate goal of escaping the island. This includes farting himself across the water like a jet ski, shooting a rope out of his mouth to help the pair scale a cliff and creating sparks with his mouth. Did I mention he farts? A lot? I saw this movie earlier this summer with a few friends of mine who are admittedly not film buffs like myself. To them, this movie was comically absurd, which I understand. But if you’re willing to look beyond the ridiculous humor, you’ll find that there’s a lot more to this movie. Swiss Army Man plays like a dream you can’t fully explain upon waking up. But it’s beautiful. Yes, “the farting corpse movie” really is stunningly beautiful. It runs roughly 100 minutes long and the middle hour is especially well done. Hank and Manny set up a safe haven in the middle of a forest on the island where Hank teaches Manny what it means to be alive. They explore humanity and society by recreating it, making detailed models of real life people and places. Hank recreates everyday scenarios, showing Manny proper public etiquette, and Manny constantly questions social norms such as why we can’t speak truthfully about how we feel. This leads Hank to repeatedly re-evaluate what he has been raised to believe. After seeing it, I was surprised by how deep and emotional this movie was. Hank’s honest Q&A sessions with Manny allows the film to fully flesh out his character. We see and hear his emotions and innermost thoughts on society, and we can identify with him. Even though this film is divisive, most people will likely be able to take something away from it. It may be the stunning visuals, it may be the brief moments of emotion or it may just be a simple joke. Paul Dano gives an incredible leading performance. His emotions are raw and poignant. Through most of the film, Dano’s character is calm and understanding of Manny’s personal questions, but the few times he explodes into an intense answer, we feel the frustration behind his inability to justify his own feelings. Daniel Radcliffe is equally impressive as he continues to try and shed the Harry Potter label. His part as the inquisitive manchild makes for a fantastic counterpart to Dano. Manny doesn’t react to things with his face or his body, so Radcliffe has to rely on inflections in his voice to relay his emotions — and he hits just the right note every time. For much of the movie, these two are the only living things on the screen, and it works. They’re all we need. Their chemistry is excellent and only adds to the fantastical and dream-like elements surrounding them. Probably the most memorable aspect of Swiss Army Man is the soundtrack. Done in a capella using a lot of the dialogue in the film, I was able to get swept up in every song. Each time the music plays, it is the perfect accent to whatever is unfolding on screen and really adds to the experience. Overall, this is an astoundingly original, surreal film. Bright visuals splash across the screen as the audience is left to stare in wonder at shot after shot, taking in a vision that is probably unlike anything they’ve seen before. It is sure to divide audiences on initial impressions of the film, but I fully believe that this film can offer at least something small for everyone, and that it will be talked about as a cult classic for years to come. Definitely check out Swiss Army Man if you get a chance, if for nothing more than the chance to see something different in a year filled with unoriginal sequels and franchise continuations. Make sure to keep an eye out for the “Daniels” directing pair in the future to see what other insane films they can come up with. This was an incredibly well done movie. If you didn’t understand the lesson in this movie then that is sad. Superior performances by Paul Dano and Daniel Radcliffe.